Everyone remembers Nolan Ryans no-hitters, but few realize that he had a dozen one-hitters. Roger Mariss record-setting 61 homers is a part of every baseball fans memory; Jimmie Foxxs 58 home runs in 1932 are largely forgotten. 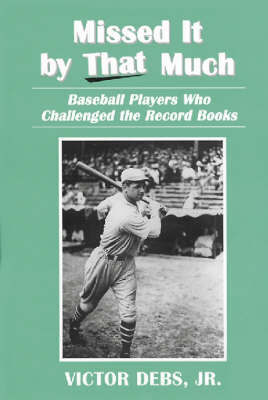 The stories of 12 near-record breaking performances are recounted here, such as Bill Terrys 254 hits in a season, three short of the record; Pedro Guerrero reaching base safely in 14 consecutive at-bats, two shy of Ted Williams mark; and Pete Roses 44-game hit streak, tying Willie Keelers mark. Boxscores and tables capsulize the players efforts.